Since its startup in the mid 1970s, Cosen has had continuous growth and developed into one of the world's largest specialized band saw manufacturers. Today's Cosen manufactures over 60 types of saws including manual, semi-automatic, automatic, and CNC in types and from 8" to 80" in capacity. 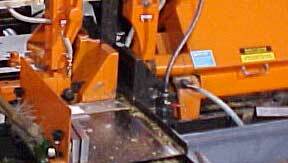 Cosen has sold more than 50,000 band saws sold to all five continents including Europe and Asia. Cosen's markets expand internationally to over 50 countries through authorized distributors for the metal cutting industry. For all Cosen model 2028 bandsaws running a 1.50" Sawblade. Sold as a set of four. Replaces the Cosen saw part numbers AGB-70413, AGB-70414, AGB-70423, AGB-70424. Blade Guide Roller* These Roller Guides act as "Side Guides" holding the Saw Blade straight during cutting. Radial Bearing* These Roller Guides act as "Side Guides" holding the Saw Blade straight during cutting.